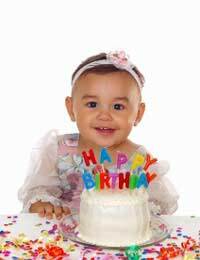 Every day is an adventure for your baby or toddler, which makes planning a birthday party for this age group extremely rewarding and loads of fun. Once this decision is made, you can get your party hat on and burst into action! If your little one is a member of a nursery or toddler group, swimming or baby ‘gymnastic’ group, you will have an idea of what your local facilities have to offer. Some leisure centres have soft play rooms for the very young and a few family pubs cater for toddler parties, with a choice of menu, balloons and so on.If you want to make the party more personal by holding it at home, here are some tips to get you started. Consider the stage of your baby’s development-this makes a great deal of difference to emotional and physical capabilities, safety during- and length of time spent at-the party.Will the guests be of a similar age, or will older family members, like brothers, sisters, cousins, be there? Are you able to offer a quiet place for breast-feeding and/or fractious toddlers who need some time out from the noise and excitement?Is there a nappy changing area that is safely equipped, warm and clean? No doubt your home is already geared towards child safety, so why not use it for the party? Music for little ones to clap and wobble to is very important; familiar nursery rhymes that parentscan sing-along and do the actions to are always well received by young children.Stimulating colours in the party room provide excitement and focal points for babies and toddlers. Tie (or stick) bunches of balloons, banners and securely suspended mobiles up high to create pleasing movement and place some toy boxes, with age-appropriate soft toys, hats and play mats around the party room. Toddlers will appreciate their own table and chairs arrangement, especially if you prepare it for them with paper, crayons and other creative materials. Use the facilities and equipment that you have in place for your own child. If he or she has a favourite toy, though, it may be an idea for them to put it away in a safe place. Although learning to share is important, some children may not be able to cope with their ‘security blanket’ being handled by another child. If the weather is fine, a trip to the park with a picnic makes a lovely baby and toddler party. It also means you don’t have all the clearing up to do!In good weather, you might choose to hold the party in your own garden; if it is already child-friendly and equipped for play, you can combine indoor and outdoor facilities, so that your intrepid explorers have the best of both worlds. To create a unique memento of your baby or toddlers birthday-and provide fun-a roll of lining paper and trays of child-friendly paint sum up the whole event beautifully.Little ones love to stick their feet in the paint trays and leave their brightly coloured footprints on the paper. Keep a list of the names of children who leave their mark; who knows, your children may still be friends in 20 years time! Provide water, juice, milk or squash for children and tea or coffee for the parents. Use pastry cutters to shape jam or honey and banana sandwiches, plastic bowls containing savoury biscuits, cucumber, carrot and celery sticks-perhaps with an appropriate dip, cherry tomatoes, cocktail sausages, mild cheese cubes, triangles and grapes. Open bridge rolls, cut into bite-size pieces and filled with cream cheese and mandarin segments go well, as do tuna mixed with tomato ketchup!Jelly, fruit salad and ice cream are favourite party fare, too and a selection of biscuits and small cakesare perfect for little fingers to squish.Brightly decorated paper napkins and tablecloths, along with bowls, cups, hats and straws for older children, can transform every table into a party table. The birthday cake, with candle, is usually the highlight of a child’s party and they love the sing-song that accompanies it!For everyone’s sake, keep parties for this age group short and sweet-about 2 hours is plenty.They are exhausting and exciting times that are best not overdone!